Need A Ford Mustang Mirror ? Check out these cool new side mirrors and Rearview Mirrors. 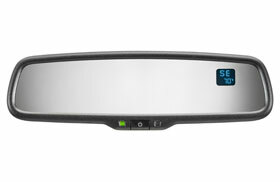 The Ford Mustang Mirror types are listed by the year and model of your car. That can be fixed too, with Chrome Mirror Covers for your 2005 to 2009 Mustang. How about a cool Electric Signal Mirrors with a Rear signal mirror conversion kit for your 2005 Mustang. Or even a Mustang body kit mirror cover to match your 2005 to 2007 Mustang body kit. Just click on the blue links for prices and more information. Here's a nice looking safety addition to your car's interior. This auto dimming mirror cuts glare from traffic automatically. And if you live in places like Seattle, it also includes a digital compass to help figure out where the heck you are! This Ford Mustang rearview mirror, fits 1965-2011 vehicles. It'd make an awesome Christmas or birthday present for that special someone (or maybe yourself). These Mustang mirrors, are popular Replacement Mirrors to fit your 1987 to 2004 pony car. Available in manual or remote models. 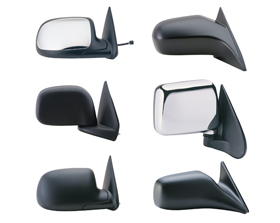 Looking for an inexpensive replacement for your 1999-2004 Mustang Mirror ? This nice quality power mirror, fits 1999 2000 2001 2002 2003 and 2004 pony cars. Here's a sleek looking foldable mirror that fits any 1999-2002 Mustang. It's a direct fit OEM replacement Mustang mirror with a breakaway design. This replacement mirror fits the 2005-2009 Ford Mustang. It features a quality textured surface, OEM connectors and comes with a 2 year warranty.